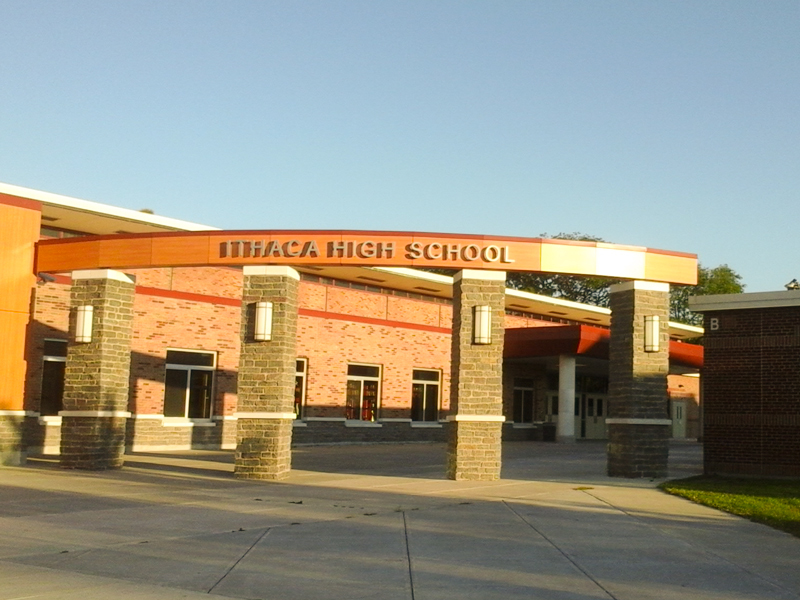 The exterior of Ithaca High School on Monday, September 8. The Ithaca City School District has begun its search to replace Ithaca High School Principal Jarrett Powers who will leave his position on November 1. Powers is set to end his three-year tenure as principal in order to become the new Superintendent of Schools with the Union Springs School District in Union Springs. The Ithaca City School District will name an interim principal while it and the Board of Education begin a nationwide search process to replace Powers. Ithaca City School District Superintendent Dr. Luvelle Brown said the position of interim is just as important as the full-time hire. “ICSD is seeking an interim high school principal who will be committed to the success of every child,” Brown said. According to the job posting, the deadline for applicants passed on September 12.The posting first appeared on the Ithaca City School District’s human resource page in mid-August stating specific qualities the district is looking for in an interim candidate. The posting also stated the position’s salary would range from $110,000 to $125,000 and that the job would begin immediately. Brown stated in an email that although the district accepted applications from people outside of the district, an internal hiring is also possible. Brown emphasized that the greater Ithaca High School community, including students, would be involved in the hiring process. One internal employee who said is not interested in the potential promotion is Ithaca High School Associate Principal Tokinma Killins. Killins said she was not interested in the job citing both her desire to be a middle school principal and a wish to work in a much more intimate environment than the 1500-student Ithaca High School. The high school’s other associate principal, Martha Hardesty, was not available for comment. Killins said she would aid in the search for a new principal if the district and its Board of Education asked for it. Board of Education President Rob Ainslie did not answer repeated interview requests regarding the search process. When announcing Powers’ departure, the School District credited Powers for expanding the high school’s curriculum to include more Advanced Placement courses as well as more electives in subjects such as: Math, Social Studies and English. Killins said she is expecting the new principal to continue the school’s academic progress. While Killins’ involvement with the district’s search process is yet to be determined, the PTA will be actively involved. Amita Verma, president of the Ithaca High School PTA, said parents would serve on the district’s interview committee, which is typically formed whenever the district is making significant hires. Verma will begin soliciting requests for parents to serve on the committee after the PTA Council meets on Tuesday. As a parent, Verma said the new principal needs to ensure the school betters the holistic experience for its students. Although the district did not provide a specific timeline for the hire, Brown stated that an interim could potentially secure the long-term position if he or she meets the board of education’s standards. See this post on Ithaca Week.